We’re serious about YOU having fun! Exciting woodland and field game zones! Covert Combat… it’s not just for boys! Book as a group, or let us team you up! Patience has its rewards! Play as a sniper! Book on your own… or bring a big group! Covert Combat… you’ll never “tyre” of it! Our “aim” is for maximum fun! A memorable way to spend a birthday, stag/hen party, etc… or just for a fun day out! Rain? We prefer the term “liquid fun”! AFTER 12 YEARS OF FUN, WE HAVE PERMANENTLY CLOSED IN ORDER TO SPEND MORE TIME WITH OUR FAMILY! Covert Combat Outdoor Lazertag (also known as Laser Tag, Lazer Combat or Lazer Skirmish) is an amazing team game of simulated combat fun. Realistic amplified sound effects – these come from a speaker in your gun, and accurately simulate shooting sounds, reloading sounds, etc… no feeble “phut phut” sounds like on paintball guns! Covert Combat is not like some of the indoor lazertag games you might previously have played; it uses state-of-the-art digital lazer combat equipment in an exciting outdoor environment. If you imagine the adrenaline of similar combat activities such as paintball and airsoft, combined with the fun of playing PC and console games such as Call of Duty: Advanced Warfare™, Battlefield 4™, or Halo 5: Guardians™, you’ll have some idea of what to expect when you come to play with us! Set in the beautiful grounds of Scorrier Estate near Redruth/Camborne, just one mile off the main A30 trunk road, Covert Combat Outdoor Lazertag provides players with a thrilling gaming experience that you’ll want to repeat time and time again. At Covert Combat, players are each equipped with a high-spec “gun”, which fires harmless and invisible “lazer” signals, rather than the painful projectiles which are used in other similar activities such as paintball and airsoft. Attached to each “gun” are light-weight sensors which are worn on the player’s head, and used to register “hits”. Once players have been kitted-up, and following a safety briefing, game marshals set them exciting missions to complete, often using props to enhance the authenticity of the experience. Missions can take place on a variety of terrain including field and woodland. The outdoor setting provides the same authentic “army” experience offered by similar activities such as airsoft and paintball. We regularly accept bookings for birthday groups, stag parties, hen parties, corporate team-building and corporate entertainment, Christmas parties… and just fun days out! 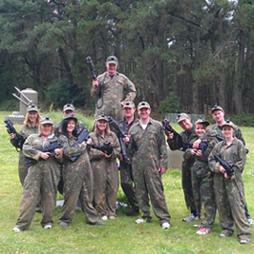 Visit us to find out for yourself why Covert Combat Outdoor Lazertag in Redruth is such a popular activity! 10.00am – 12.00 Noon (2 Hour Session). We may be able to run a session at other times… feel free to contact us if you want to request a session at a different time to those listed above. We do also sometimes run special sessions at different times… these will generally be advertised on our Facebook page, and via e-mails sent to everyone on our “VIP e-mail newsletter” list, which you can signup to using the yelow and black form on the right-hand side of this website. N.B. All sessions will close for online booking 24 hours in advance of the session date, or sooner if all spaces in that session are full. If you are looking to book at short notice (less than 24 hours in advance of the session date), you are welcome to contact us using our online enquiry form to see if there are spaces available, but they will not show up on the online booking calendar. Please do NOT telephone to enquire about session availability, as we won’t be able to give an immediate answer over the telephone. Covert Combat is a local family-run business, not a “faceless” franchise! We pride ourselves on our high levels of customer service and attention to detail. 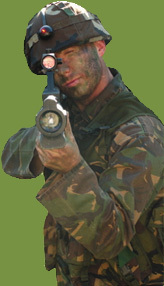 Outdoor Lazer Combat experience in Cornwall. the fun doesn’t stop in the winter, it just gets slightly muddier! Call of Duty™ is a trademark and/or registered trademark of Activision Publishing, Inc. Battlefield 4™ is a trademark and/or registered trademark of Electronic Arts, Inc. Halo 5™ is a trademark and/or registered trademark of Microsoft Corporation. Covert Combat is not in any way affiliated with any of the aforementioned trademark holders, or their products. We have some GREAT special events coming up! On Saturday 11th August we have a "Black Ops" Twilight Event for ages 16+ only. 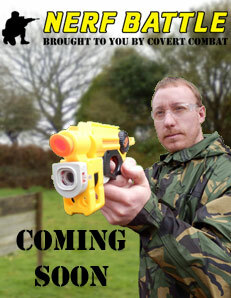 Experience Covert Combat Outdooor Lazertag like never before... in twilight and darkness! We hope you're feeling stealthy! On Sunday 19th August we are also running two Fortnite-inspired "Battle Royale" Sessions. One session is for players aged 10-15yrs (with parents also welcome to participate), and one is for ages 16+yrs. The Battle Royale events have a trophy and cash prize for the winner, so are well worth joining in with! These special events are in addition to our regular Outdoor Lazertag sessions. All bookings are taken via our website (with payment by debit or credit card) so that customers can make a booking at anytime of the day or night. For more recent news, check out our Facebook page.